The Wax On, Wax Off Tour rolls on with a new batch of 2019 tour dates. 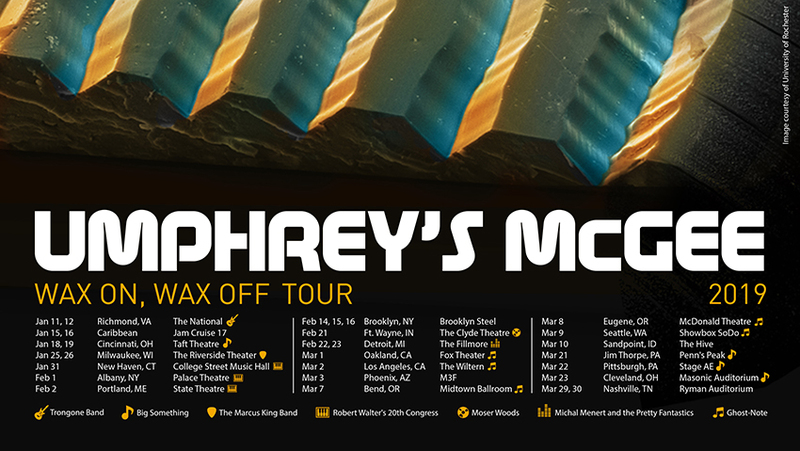 Umphrey’s McGee has the distinct pleasure of beginning — and ending — our March tour at two of the most beautiful indoor venues in the country — the fabulous Fox Theater in Oakland and the acoustically unmatched Ryman Auditorium in Nashville. Sandwiched between, a streak of rock shows along the left coast and rust belt round out the tour. Where will we see you? Ghost-Note, a percussion-heavy rotating cast led by Snarky Puppy’s “Sput” and Nate Werth, will accompany UM for the bulk of our West Coast dates. Back east, our brothers-in-arms Big Something rejoin the tour in Jim Thorpe, Pittsburgh, and Cleveland. umVIP is pleased to offer enhanced experience tickets to the renowned Ryman Auditorium in Nashville. Lock in seating in the first five rows, enjoy a private show with open bar, get exclusive merch, early entry, a signed poster, and more. Pre-sale tickets and Ryman umVIP packages will go on sale Wednesday, December 5th at 10:00 am PT / 1:00 pm ET, with a public on-sale Friday, December 7th at 10:00 am PT / 1:00 pm ET. Note: Purchasing pre-sale tickets directly from UM guarantees you the lowest possible ticket fee on every show so secure your tickets early. In addition, every ticket purchased directly from UM now includes a free MP3 download, redeemable for the show of your choosing at umlive.net. Save it to grab the show you attend or download something fresh to get you in the mood.